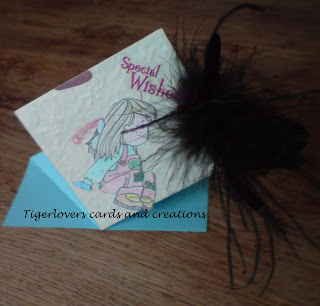 Tigerlover's cards and creations: CRAFT Challenge16, card for a child with removable item. CRAFT Challenge16, card for a child with removable item. A bit late, but finally uploaded this one as well. I'm afraid I thought I had done this one already, but unfortunately I had not yet. Only just noticed. 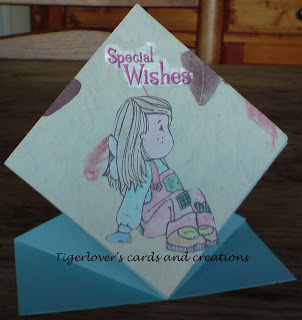 For challenge 16 at CRAFT Challenge this week the brief is to make a card for a child with a removable item. 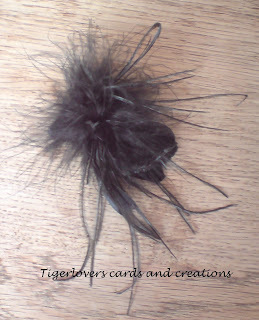 Tigerlover made this lovely card for a friend who is going to be 12 soon. It is to go with the previous challenge, the bag which carries the presents for her friend. Hope you like it. We certainly do. You can see the card here, which is a springy card. 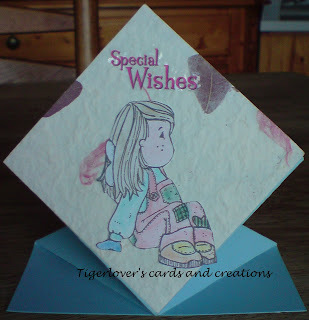 For which she added a piece of handmade paper and carefully coloured and cut out the lovely stamped image. Then added a hairclip to complete the card. Here is the card, before the clip has been added. 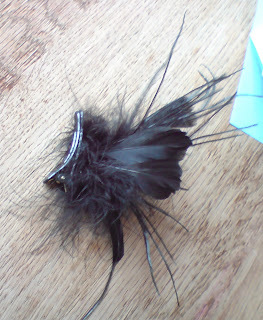 And here are 2 views of the hairclip. Thank you for looking, all comments are very welcome and very much appreciated. A lovely card, nicely coloured, and a fab gift. Hope your friend liked it.